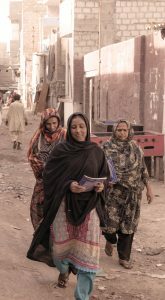 Just off the Mauripur Road in Karachi and a stone’s throw away from TCF’s Cowasjee Campus, is Machar Colony – a sprawling shantytown seemingly left to fend for itself. The community derives its name from the profession of a majority of its impoverished residents, who mostly earn a living as fishermen (Machar comes from the Urdu word for fisherman, Machera). Many others work as daily wagers at local shrimp packing factories, usually for a pittance. As you make your way into the community through its narrow dirt lanes, heaps of garbage line each side, and the strong stench of rotting fish assaults the senses. Children and unemployed youth wander listlessly on the crumbling streets. But one house, belonging to a community woman, presents an unlikely sight. A group of women pore over books, reading, learning and engaged in animated discussion. This is no ordinary household: it serves as one of the centres for ‘Aagahi’, TCF’s adult literacy programme. These women are some of the learners and managers of the programme and their drive to learn is far greater than the myriad challenges they face in their daily lives. Aagahi was initiated by TCF in 2005 in a bid to impart basic literacy and numeracy skills to the community women. The underlying objective of Aagahi is to provide a holistic learning experience to these women that plays a huge role in women empowerment; helping them make more independent and informed decisions. Additionally, mothers can directly get more involved in their child’s school progress. The programme has now evolved into a pathway for out-of-school girls and women from disadvantaged communities to learn to read and write. To date, it has benefitted 64,400 learners across Pakistan. 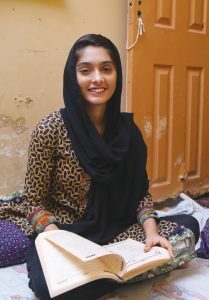 In Machar Colony, and elsewhere in the country, Aagahi is helping change the lives of brave, resilient women who juggle work, child-rearing and domestic responsibilities but remain committed to learning and improving themselves. Most of these women help their families by working as shrimp peelers in the local industry. Today, Shaheena has learned to not only read and write, but compile grocery lists and do basic budget-making for household. Shaheena’s experience is echoed by her fellow learners, who all narrate stories of progress and achievement with great pride. Asma Muhammad, one of the teachers associated with Aagahi in the area feels that the programme continues to make a life changing impact in the community. ‘Slowly and gradually, you can see these women are improving the quality of life in their families’. The learners are now in a position to assist their children with their homework and have informed discussions with teachers, Asma tells us. Bazgha Noor Muhammad works as Programme Monitor for the area and is responsible for monitoring attendance,and ensuring that learning objectives are being met. As their session for the day wraps up, Shaheena walks out with her companions to tend to her home. The spring in their step defies the harshness of their surroundings. For these women, daily life may be a struggle, but they have full faith that the knowledge they are gaining will change their lives as well as those of their families.